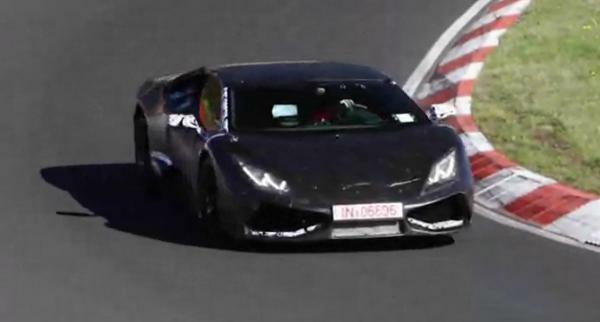 We have seen a hefty load of spyshots showing the car that many expect to be called the Lamborghini Cabrera but the video clip below offers both the best look at the Cabrera yet while also giving us our first chance to listen to the high revving V10 roar. The video offers clips of the Cabrera gradually accelerating away from the camera with low RPM shifts, examples of both upshifts and downshifts, hard acceleration with higher RPM shifts and different segments showing the car cornering – although it is never being pushed particularly hard. Details on the Lamborghini Cabrera – including whether or not it will actually be called the Cabrera – have been very limited but it was expected that the Gallardo successor will be powered by a similar 5.2L V10 as is found under the rear engine cover of the Gallardo but the first Cabrera will offer somewhere in the area of 600 horsepower. All of that power will be sent to either the rear wheels or all four wheels depending on the buyer’s wishes and it is expected that the power will be delivered by means of a super quick shifting dual clutch automatic transmission. Considering how smooth the shifts are in this video, the Lamborghini being worked out on the ‘Ring most certainly has some sort of self-shifting transmission and when you consider the speed at which this car changes gears, we have to believe that it is a high tech dual clutch transmission. In addition to letting us all bask in the warmth of the Lamborghini Cabrera revving its way along the Nürburgring, this video offers a pretty good look at the exterior design of the new supercar including a front end and side profile that could be similar to the production models. The back end still appears to be fairly nondescript (which makes sense since things like the taillight design doesn’t play much of a role in track testing) so we don’t get much insight into the rear end of the new Lamborghini but we can expect that the production Cabrera will have a curvy rump that is at least somewhere similar to this test car in terms of the basic form. Considering that one person caught the Lamborghini Cabrera testing at the Nurburgring, we can be fairly sure of two things. First, the Cabrera will probably be introduced with some Nurburgring track times to allow it to stand out in the supercar field and second, there will likely be more videos of the upcoming “base” Lamborghini testing at the world’s most famous race track. In the mean time, crank up your speakers and enjoy this short – yet excellent clip of the Cabrera in action!